The Peregrine was one of the first shoes on the market with a substantial amount of tread and cushioning that had a 4mm drop. 5 years later (I can’t believe that this shoe has been out this long, I feel old) the shoe gets its best update yet. Saucony has recently developed Everun, which is a material that is very similar to Adidas’ boost. It is a very plush and bouncy material that has much more durability and rebound than traditional EVA foam. 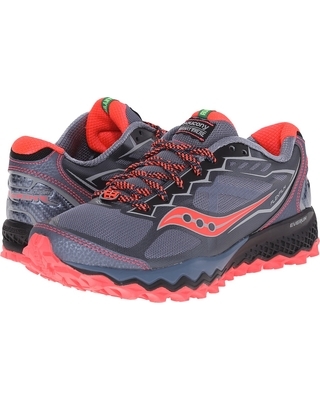 Saucony still includes eva foam in there shoes and chooses to place Everrun in key areas. I find that this produces a much more natural feel in the shoe. While some people love Boost, I often find that it feels a bit unnatural, it can simply be too bouncy when trying to running fast. The addition of Everrun and other materials allows this version of the Peregrine to posses significantly more cushioning than its predecessor but still come in at a lighter weight. All this cushion does not mean that this shoe can’t handle trails. The Peregrine is equipped with a substantial rock plate and plenty of grippy rubber that protects the foot from rocks and bites into slippery terrain. The fit is significantly wider in the toebox but it is not a overly voluminous shoe, I have a lower volume foot and I find the fit to be perfectly secure. The Peregrine has enough underfoot for longer runs but is still light enough for those days when you want to go fast. The shoe comes in at just under 10 ounces which is a perfect weight for a lightweight trail shoe. The wide platform and relatively straight last gives it some decent stability as well. The plush cushioning is a welcome addition to a lineup of trail shoes that are often firm and harsh on harder surfaces. This is one of the better updates I’ve seen in a shoe, so come give it a try even if you’ve tried it in the past and didn’t love it.